Includes 20 Gauge Steel Casket, concrete Burial Vault, services of funeral director and staff, transfer of Remains to funeral home, embalming, use of funeral home for one day visitation or parts thereof followed by Funeral Services the next day, Funeral coach, lead car (clergy car), flower car, register book, acknowledgment cards and memorial folders, does not include limousine, newspaper notices, cemetery charges, clothing, clergy offering or certified copies of death certificate. Religious services can be held at the funeral home or any church within thirty miles and burial may be at any Cemetery within thirty miles at no additional charge. Our charges for direct cremation (excluding ceremony or visitation) includes local removal (thirty miles), shelter of remains at funeral home for 24 hours, transportation to crematory, cremation container, cremation charges, necessary services of staff, authorizations and basic use of facilities. Does not include newspaper notices or certified copies of death certificate. Contact us for a General Price List containing itemized charges for all of the services and merchandise that we provide. 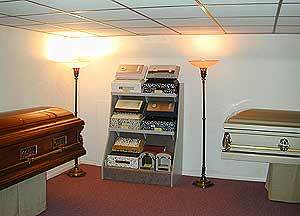 You may be comforted to know that all aspects of our services, such as embalming, Funeral Directing and attention to details are personally attended to.